You are invited to “NVision” the future in Sagemont’s new student building. Certainly this will be a beautiful building by man’s standards, but what will make it even more beautiful is what will happen inside. NVision a place where teens are growing and being challenged in their faith. NVision a place where students are excited to bring their friends to hear the gospel. NVision a training center where junior high and high school students are learning how to lead ministry and share their faith. NVision a place where together we can Impact Tomorrow Today! Today’s teens have more influence than ever before. They live transparent lives, with relationships reaching across oceans as easily as they reach across classrooms. With the power of technology in the palms of their hands, they have the ability and opportunity to spread the gospel like no generation before them. They’re already leaders. They’re already connected to the world. Through those connections, we have the opportunity to return to a time when the church influenced culture instead of culture influencing the church. When we invest into students’ lives now, we not only invest into the future church, we impact tomorrow today! The authenticity that is such a hallmark of today’s teens is also one of the greatest challenges. They see right through surface-level commitments and weak relationships born out of obligation. Instead, they want vulnerability, a safe place to ask hard questions, and adults who listen as much as they talk. The Sagemont Student Ministry is committed to meeting those needs. Our goals go beyond reaching and teaching to nurturing and mentoring because it’s not enough just to help them through school. Instead, we must give them the tools they need and show them how to grow in Christ, discern God’s will, and lead well into adulthood. Part of the legacy that continually weaves itself through Sagemont’s students is the unexpected and creative ways in which God has provided a place for them to meet. After experiencing decades of growth in a beautifully converted grocery store down and across the street from the Hughes Road Auditorium, the Student Ministry joined the main campus several years ago in a move that thrilled both parents and students alike. Unfortunately, damage from Hurricane Harvey affected much of that area, and the details required to simply repair the area prevent us from turning it into the amazing venue the students deserve. The only option is new construction. After helping hundreds of families in the days and months following the storm, Sagemont’s post-Harvey efforts have not ended yet; they will now be used to write the next chapter in the lives of Sagemont’s students. The call to rebuild that which has been damaged or destroyed is one that has swelled in the hearts of believers since long before the time of Christ. In the fifth century BC, after the walls of Jerusalem had been destroyed by the Babylonians, God used a simple cupbearer named Nehemiah to gather supplies, inspire a crew, resist opposition, unite his people, and rebuild the walls of the holy city – all in less than two months! As a church, we have had numerous opportunities to worship and minister through the call to build, just like Nehemiah and his people. And because of our commitment to remain debt-free, we can step into this season of building once again knowing that service and ministry will continue without interruption, even as the new walls form around us. And, like the people of Nehemiah’s time, we will work together across generational lines as we build these new walls. Once the walls and bricks of any new church facility begin to affect the landscape of a community, there is always a season of natural curiosity that draws the public indoors. Some churches rely on that curiosity alone, adopting a passive “if you build it, they will come” mentality. The Sagemont students have a more active approach. Knowing that a strong global impact depends on first having influence in one’s community, the amenities that easily appeal to students and their friends will be plenty – with activities such as gaga ball, video games, a coffee shop, and more - providing ample opportunities for outreach. However, in order to fulfill the Great Commission, we must do more than invite and entertain; we must go and tell. 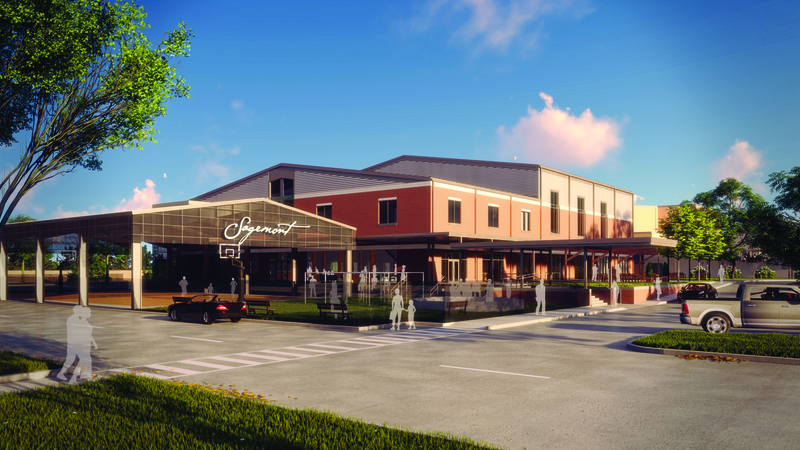 So in addition to basketball and ping pong, the Student Building will also be a place of serious training and discipleship opportunities, equipping students to take the gospel outside of the comfort of the Student Building and into their schools, neighborhoods, workplaces, and homes. Together we can NVision a beautiful new home to provide the best possible training ground for tomorrow’s leaders. This project will take all of us working together, just as it did when Nehemiah led the people of Israel to rebuild Jerusalem’s walls. What you can do immediately as we begin is to make a commitment to give. Seek the Lord and His will as you determine what you will give. Look beyond what you can see and ask Him to provide more than you can think or imagine. Sometimes the greatest gifts come from the least likely places! Many in our congregation do not currently have children or teenagers who will use this building. This endeavor still needs everyone to be a part! Even if your family will not directly use the building, we would strongly encourage you to commit to strengthening the future of the Church. Not just Sagemont Church, but Christ’s bride, the Church. As you can see from the testimonies of those who have gone before, the Sagemont Student Ministry continues to impact others all over the world through the men and women who have grown up in this ministry. Every student who learns, grows, and trains in this ministry will be impacting someone else in the future. Let’s work together to make it an impact for the Lord! Sagemont Church never requires signed pledge cards in our building programs, so any commitment you make will be between you and the Lord. To give, you can simply give via an offering envelope deposited in an offering receptacle around campus or you can give online HERE. Either way, any gift given to “NVision: Impact Tomorrow Today” will be applied to this program. Any funds given to the Living Proof Project (our former building program) will be directed to this current project. With the estimated cost of $12 million, this program is expected to take between two and three years to complete, depending on the construction process and how the Lord provides the funds. Will you pray today and commit to being a part of NVision? You will be investing in the future of the Kingdom! I Want to Impact Tomorrow Today!